Hon. 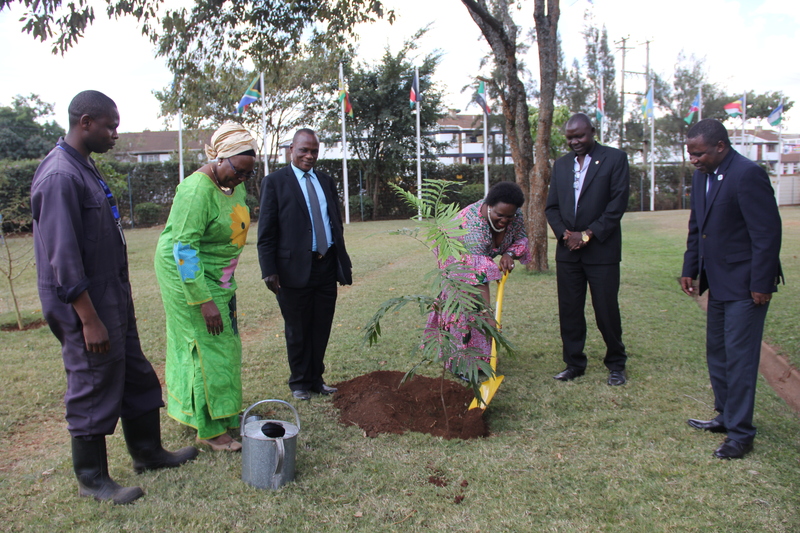 Betty Amongi Ongom, Minister of Lands, Housing and Urban Development, Republic of Uganda visited RCMRD on November 7, 2018. 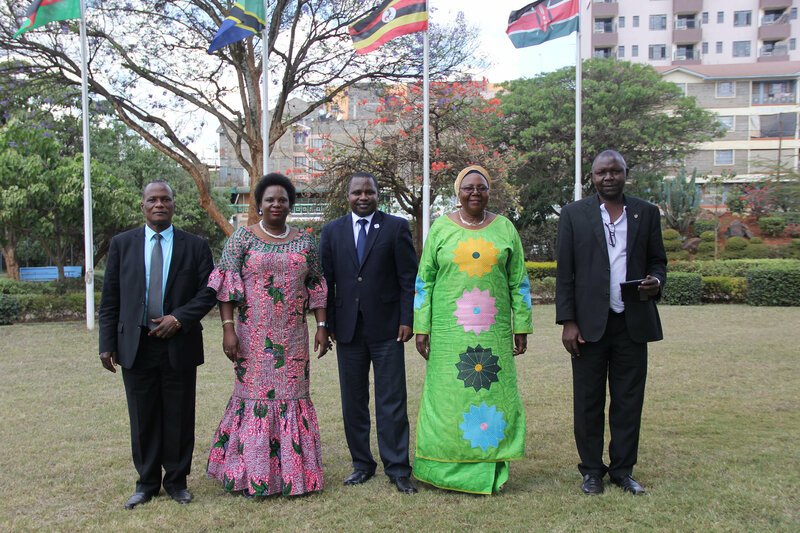 Minister Ongom led a team comprising members of the Uganda Parliament Infrastructure Committee (PIC). The Director General of RCMRD Dr. Emmanuel Nkurunziza noted that Uganda was the first signatory to the Agreement that set up the RCMRD in 1975. He also congratulated Uganda for being among the member States that have never defaulted on payment of subscription fees which are part of the RCMRD revenue streams. 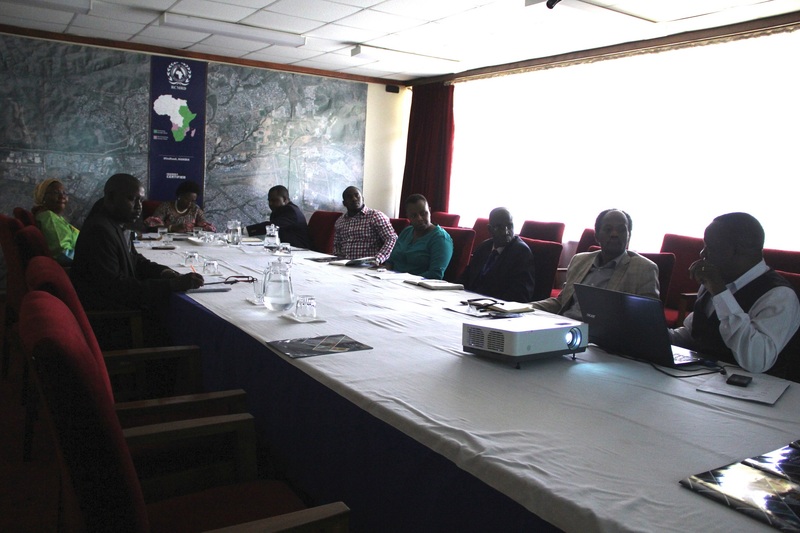 Mr. Vincent Mtaroni RCMRD's Principal GIS and Cartographic Officer presented about all the services that RCMRD offers to member States and beyond and the new services added. He said RCMRD offers training in Land Survey, Photogrammetry, Remote sensing, GIT, Training services, Service and calibration of instruments. He went on to talk about the projects including SERVIR-ESA and GMES using a pictorial to describe how vast the RCMRD network was. The presentation mentioned that the projects cover four thematic areas which cover 23 service points. Dr. Nkurunziza briefed her of RCMRD activities in support of national institutions in member States in relation to Geo-information and different services being provided to the member States. The members of the Uganda PIC Hon. Syda N. Bbumba the MP Nakaseke North Constituency and Hon. Kumama Nsamba George Wilson the MP BbaaleCounty were with Minister Ongom. The minister said Uganda's Cabinet had requested her ministry come up with a one map project. "That map shall be a spatial map containing infrastructural developments, i.e. roads, drainage system physical planning, valuation for each parcel of land. All this information should then be digitized and made available through the internet". Hon. Syda Bbumba admitted that, " I came here with little knowledge on these maps but now I can go back knowing that I know something. 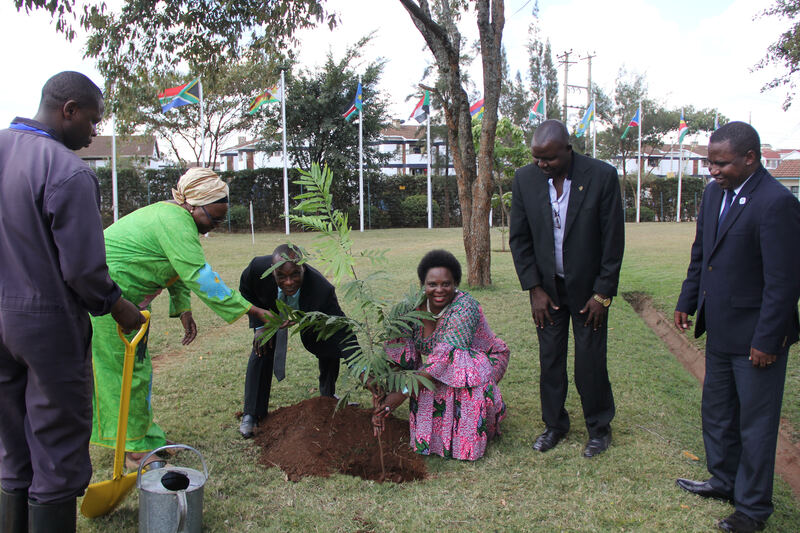 She thanked the minister for the opportunity presented and the DG for sparing some time despite the short notice given. “What I’ve learnt is that you can’t develop much without a land policy and this info is something we needed to get yesterday. We really need to intensify the process of officiating this policy because we are the ones who’ll benefit from it." After listening to the presentations by the RCMRD DG and the technical department team, Minister Ongom asked RCMRD to use the experience the Center had gathered working on similar projects (SGR in Kenya and Kisumu County Spatial Plan), if this data gathered will help the ministry better manage the overall costs of infrastructural projects. She cited the example of people displaced to pave way for the construction of the 87-kilometre Acholibur-Musingo road, which passes through the districts of Pader, Kitgum and Lamwo. She says some unscrupulous officials dealing with the compensations had told some people that they would be compensated to the tune of millions of shillings. She also talked of people making false claims or rebuilding on earlier compensated lands because the ministry has not protected what it has compensated. The minister said some locals claimed that because of delayed compensation, they were unable to relocate from the road reserves. So in the meantime there were no provisions for drainage channels. "The road level is way higher than the floor level of houses and shops, meaning that when it rains, the flood waters drain from higher ground to lower grounds, rendering several houses uninhabitable," minister Ongom said. In response, Dr. Nkurunziza said “spatial information is the foundation of many of the development projects. Unless you know where things are, you cannot do much. Using spatial data, you can go as far as giving land the right value, this from the amount of data present within the parcel of land. This I believe will help curb that issue of people overvaluing the land while compensating.” He added that land registration was do-able, and all that RCMRD needed were the right resources and materials along with the support from the Government of Uganda through the Lands Ministry.